At Southern Dental Care we perform nearly all facets of dentistry. However, our speciality is people. We focus on YOU so we can customise a treatment plan tailored to what you need and want. Nothing is too big or too small. 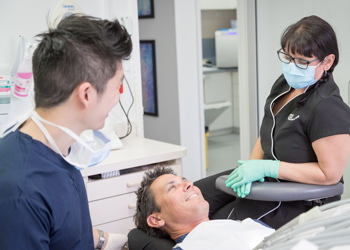 Dr Daniel Chan, BDSc(Hons) has provided over a decade of comprehensive dental care in our Mandurah practice. From minimally invasive dentistry to complex sleep sedation services and cosmetic dentistry we desire to make your experience with us a positive one. As a licensed sedation dentist, Daniel is able to help his patients relax during their complex or lengthier procedures. Our goal is to help you overcome your dental fear or anxiety so that you can preserve your oral health as best as possible. As a member of the Australasian Academy of Dento-Facial Aesthetics, Daniel implements dermal fillers and facial relaxants as part of our line of care. After all, a beautiful smile is more than just healthy teeth! We want to help you feel confident about more than just the way your smile looks. Our cosmetic dentistry services and full mouth rehabilitation options help to promote health and confidence in our patients. From simple whitening to crowns and veneers to rejuvenate and enhance your smile, we will customise a care plan that fits your personal needs and preferences. Are your wisdom teeth causing pain or discomfort? In some cases, wisdom teeth may need to be removed before they can damage the health of the teeth adjacent to them. In many situations, we can comfortably remove wisdom teeth here in our office without referring you to a specialist. Our facility delivers boutique service and quality care that you can trust, individually tailored to your needs. If you’re looking for a dental provider who will provide you with a wider variety of service options, we invite you to schedule your next visit with us. Contact us today to get started.